Hi, I am interested in your 2019 JAYCO Jay Series Sport (stock #15398) listed on Autotrader for $18,321. I'd like to get more information about this vehicle and confirm its availability. This unit includes Jaycos Customer Value Pkg., Deluxe Plumbing Package, powered roof vent, stereo w/inter. & ext. speakers, 16K BTU furnace, power lift motor, aluminum rims & exterior grill. This Jay Sport camping trailer is the perfect way to hit the open road at a moments notice. This entire unit is compact and easy to tow, yet it comes packed full of usable living space, like the U-shaped booth dinette which turns into a bed whenever you need it to. The two tent end beds hold up to 1,050 pounds and protect you from moisture while you sleep with their DuraTek water-repellent tent coverings. The carry-out stove is a convenient way for you to cook dinner outdoors when the weather is nice, and the residential-sized cabinetry is helpful when storing all of those pots and pans. 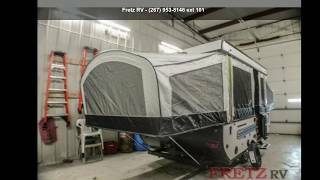 In this camping trailer by Jayco, you can trust the very foundation it has been built upon because theintegrated A-framehas been designed to prevent corrosion and buckling while on the road. The one-piece wooden floor deck is known as the strongest in the industry, and the wall-to-wallBeauflor vinyl flooringkeeps the interior of this camper looking fresh and stylish. Not only is the base of this structure built with quality craftsmanship, but so is theone-piece fiberglass roofthat is shaped into a dome for better water run off and leak prevention. On top of all of this, Jayco has included its2-year limited warrantyso that the only thing you need to worry about is where you will be taking your next adventure in this camping trailer.